So, who says they’re just weeds? Cotton is pervasive in the production of textiles. However, research scientists and enterprises are looking for alternatives – and placing their bets on a domestic plant. 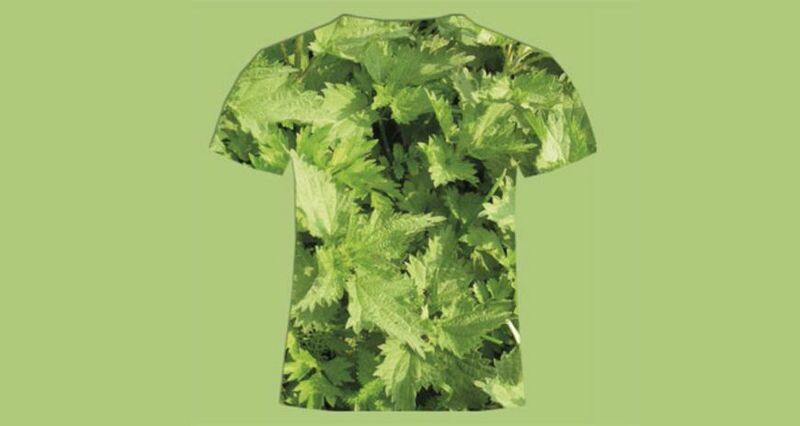 It has an impressive life-cycle assessment, but the mere thought of wearing a t-shirt made of stinging nettle fibre might be too creepy for many people. The field in Hungary is as big as 15 football pitches placed side-by-side – and this is where the feared plants are growing, densely packed together. Nobody would ever dare to get too close with their bare arms or legs since the farmers are cultivating a plant here that is ill-reputed as a weed with nasty side-effects – the stinging nettle. But this plant shouldn’t really be of danger to anyone out on the ten-hectare piece of land. It is all part of a spectacular experiment in which research scientists want to obtain fibres from the stinging nettle and produce textiles from them. The reason: the stinging nettle plants could, over the long term, become an environmentally-friendly alternative to cotton. “We have to consider stinging nettle in connection with the domestic bast plants – hemp and flax,” says fibre expert Kai Nebel from Reutlingen University. This is because stinging nettle has been highly valued as an alternative to hemp and linen – since medieval times. Back then people manufactured ropes, sails and even clothing on the basis of stinging nettle. For this purpose they used the fibres in the stalks – a section of the plant that does not trigger the allergic reaction. For generations now growers have been working on increasing the fibre content in the nettles growing in the wild, in order to make production more cost-effective. The crucial point in textile production thus far has always been a procedure whereby the fibre was separated from the wooden core of the stalk – the process that is necessary for obtaining any kind of usable material. When engineer Kai Nebel describes the technique, it becomes clear why it is so complicated. This time-honoured agricultural method is called ‘field retting’ by the experts, and it involves spreading the plant stalks out in the open field. In this retting (i.e. rotting) process, bacteria emerge that dissolve the pectins; this is the substance that binds, as a natural glue, the fibres with the wood. The field retting does have its disadvantages however: it takes several weeks, and if heavy rains fall during this phase, this can destroy the entire harvest. Subsequent to the high-risk field retting process, in the past the bast fibres were mechanically purged from wood sections. In order to be able to spin fine, cotton-like yarn, an additional chemical process was necessary with which the individual fibres were released from the bast bond. Due to this investment of time and effort, the price for the soft fibres was too high and the yields per hectare were too low to establish the stinging nettle as a competitive source product for the textile industry, says Kai Nebel. This is where the work of Carolin Schneider begins: she is director of the Institut für Pflanzenkultur in Schnega in Lower Saxony, where she conducts research with partners on behalf of the Fachagentur für Nachwachsende Rohstoffe (FNR) and the German Federal Environmental Foundation (DBU). Together with colleagues, she investigates the fibres – and, from particularly suitable mother plants, she removes cuttings that are subsequently planted. They were thus able to increase the stinging nettle fibre content from 15 to 20 percent. It is this special cultivation, then, that is grown on the ten-hectare field in Hungary. In the background of this large experiment, we find textile producer Mattes and Ammann from the Swabian town of Meßstetten in Baden Württemberg. The firm has developed, jointly with external partners, a technological procedure that is meant to replace the field retting process – how that works exactly is something that is, however, being kept secret since the method is currently being patented. But they are in any case quite optimistic – the initial samples are to be produced within this year. Sales Director Werner Moser sees an opportunity here for complementing the product range from cotton – with stinging nettle fibres. It is said however that it is still too expensive: nettle fibres from the Himalayas cost 45 euros per running meter, while cotton products come to about five euros. And the farmers would have to be persuaded to grow huge quantities of stinging nettle: the firm Mattes and Ammann alone processes 500 to 1000 tonnes of cotton per year – should this quantity be replaced by stinging nettle, about 8,000 hectares of arable land would be required for this. If the new technological procedure for obtaining fibres is successful, the environment could profit enormously from this since cotton production requires huge quantities of water. Up to 20,000 litres are needed for the fabric that is used to make one single t-shirt. The stinging nettle, on the other hand, is much more modest – it grows quite well with natural precipitation.